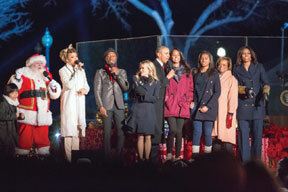 The first family joined performers onstage for a song at the official lighting of the National Christmas Tree on the White House Ellipse. WASHINGTON – On a brisk December night, the First Family joined hundreds of people to officially light the 2015 National Christmas Tree recently on the White House Ellipse. The ceremony was hosted by Oscar-winner Reese Witherspoon and featured performances from musical trio David Crosby, Stephen Stills and Graham Nash; Fall Out Boys, Andra Day, Aloe Blacc, Scandal’s Bellamy Young, Kelsea Ballerini, Tori Kelly, Trombone Shorty, the Joyous String Ensemble and the United States Coast Guard Band. There was also a special appearance by Miss Piggy. The oldest full-time park ranger, 94-year-old Betty Reid Soskin, introduced President Obama. Soskin works five days a week at the Rosie the Riveter/World War II Home Front National Historical Park in Richmond, Calif.
After leading the crowd in a countdown, the President, First Lady Michelle Obama, their daughters, Malia and Sasha, and First Lady Michelle Obama’s mother, Marian Robinson, took the stage to light the tree at the 93rd annual National Christmas Tree Lighting. “So on behalf of Michelle, and Malia, and Sasha, and Grandma, and Bo and Sunny (the family’s dogs), happy holidays to all of you,” President Obama said.